the ball has nestled against the collar of the green. With your ball against the collar you have more chance of contacting it cleanly with the raised front edge of your wedge than with your putter. Dave Pelz in his Putting Bible states that you should never putt from a bad lie. He explains that your putter is a poor choice of clubs if blades of grass can get trapped between the putterface and the ball. The design of the wedge is well-suited to this special shot because it does not have to go through the grass before it makes contact with the ball. This is because most wedges have a built-in bounce. Bounce is the angle in degrees from the leading edge to the point where the club rests on the ground at address. In simple terms the leading edge of a wedge is higher than its sole or trailing edge unless the wedge has zero bounce. The greater the amount of bounce, the less the wedge will dig into the turf or sand. How do you decide which wedge to use if you carry several wedges? In deciding which wedge to use, your pitching wedge is a better bet than your other wedges as it has a slightly straighter leading edge which is more forgiving of a mishit. The technique is to strike the equator or middle of the ball with the leading edge. This sometimes happens accidentally when you skull a chip. However, this time you are deliberately bellying the ball. The way to play the shot is to putt it with your normal putting setup and stroke. Because the wedge is a longer club than your putter you will have to choke down a little on the grip. This will allow you to get your eyes more over the ball. The key as with any putt is to make a smooth and unhurried stroke. There is an alternative shot when against the collar that is somewhat riskier than the bladed or bellied wedge. Here you can use your putter, but only if it is blade-styled. Mallet putters won't work. The idea is to use the square toe end of your putter to contact the ball. Because your putter is turned so the toe is now pointing at your target, it presents a smaller surface area and has less chance of getting caught in the grass. To avoid a mishit through the putter twisting in your stroke, you should hold the grip a little firmer. You may have seen other variations of the bladed wedge using a hybrid or 3-wood. However, these clubs are better suited when your ball is in rough grass on the apron rather than in the first cut against the collar. 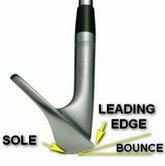 Whenever you can't get to the back of the ball with your putter, a smarter choice is to use the leading edge of your wedge.